Despite the many variations of besan ladoos I have tasted, nothing brings back Diwali for me as these do. The aromas of besan roasting in ghee till it was brown and fragrant, the ping of the mortar and pestle as it pounded cardamom pods and nutmeg to a fine powder and vast quantities of nuts and raisins being chopped into tiny slivers – hard work, but we were willing participants for all the tasting we could do under the guise of helping. 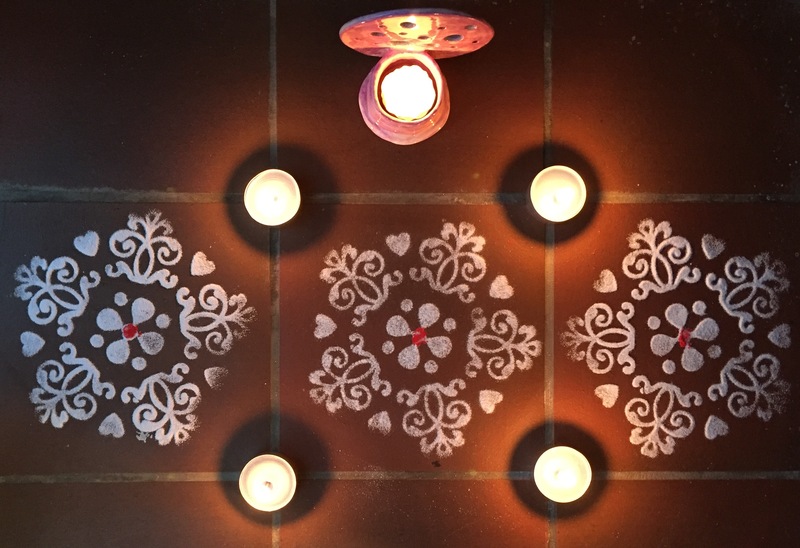 It all contributed to the exciting buzz that surrounds the preparation for Diwali. It still does! Whisk the besan to get rid of any lumps. In a sturdy pan, heat the ghee until it is just melted. Add the besan and stir well until it is well mixed. Keep stirring until the besan turns golden brown and gives off a wonderful nutty aroma. Add the milk at this stage. Once you add the milk, the whole mixture is likely to froth and erupt like a volcano gone mad. (You may wonder if you’ve curdled the mixture and whether you should throw it away and start afresh. Don’t. Just keep the faith and keep stirring. It will soon calm down.) Keep stirring and the mixture will come together in a few minutes. At this stage, it should look like wet sand. Stir for a few more minutes so that the besan does not stick to the pan and burn. Turn off the heat and let cool for about 30 minutes. 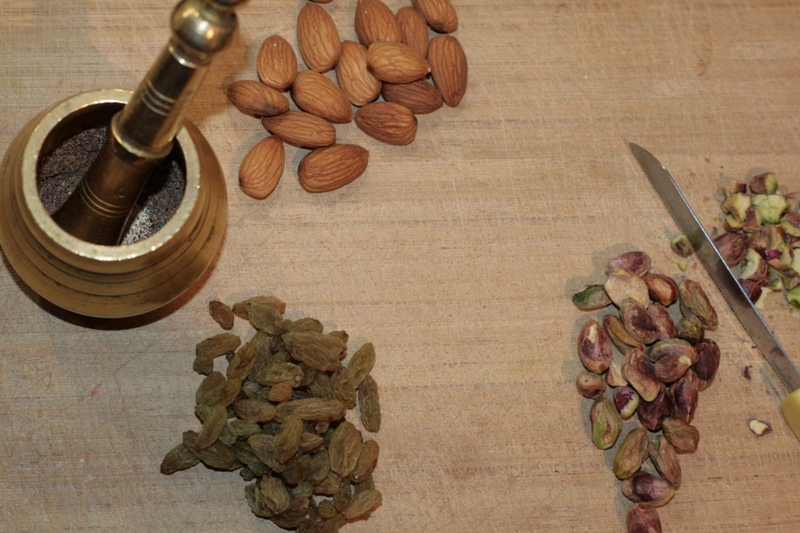 When the mixture has cooled, add the sugar, the powdered cardamom and nutmeg and the saffron. Add the milk at this stage. Knead sugar and spices into the mixture. Add the chopped nuts and raisins. Knead into balls. 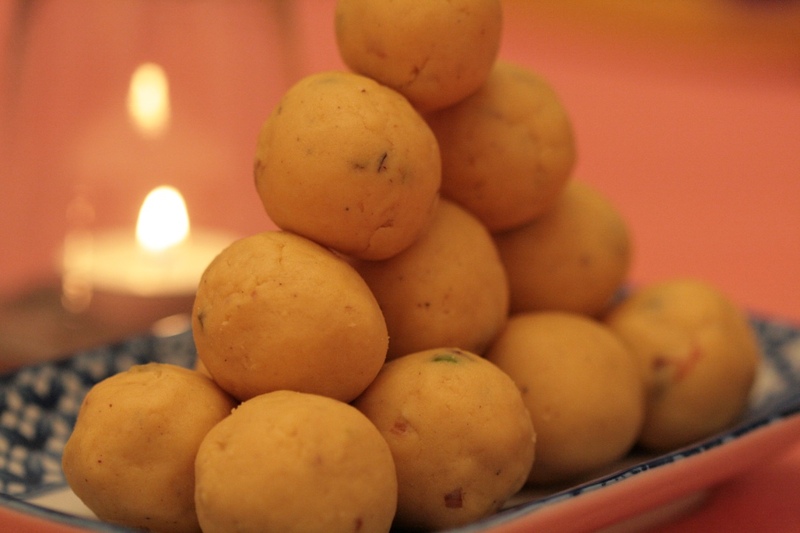 The besan ladoos are ready to serve but before you do, pop one into your own mouth and you’ll know how good they are. This entry was posted in Desserts, Festive food and tagged besan laadus, besan laddoos, besan ladoos, chickpea flour, Diwali, Diwali desserts, Diwali sweets, epicurious, gluten free, laddoos, Mumsnet Blogging Network, Yummly. Bookmark the permalink. Looks yum! And I totally get the sense of accomplishment! I tried to make Kaju Katli and they turned out pretty ok 🙂 Happy Diwali!